Description: In this shot we are looking south towards the Rutland engine house and the start of the B+R sub. On the east lead (furthest left) is the 801, on the B+R (middle) are the 204, 311, 303 and on the Pig Ramp (right) are the 201 and 304. Later on all but the 801 will be used on the CLP 264 job, bringng back 8900 tons to Rutland. Description: WACR northbound WJNP rolls along the shoreline of Crystal Lake just south of Barton, Vermont. Today's train consists of CLP GP38 204 and 2 cars of mixed freight. Description: WACR southbound NPWJ passes old farm and construction equipment in West Burke, Vermont. Today's train consists of CLP GP38-2 204 and 7 cars of mixed freight. 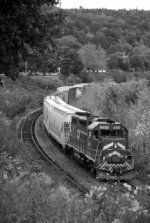 Description: WACR southbound NPWJ rolls through St. Johnsbury Center, Vermont on a sunny, autumn day. Todays train consists of CLP GP38 204 and two boxcars. Description: WACR southbound NPWJ rolls through the "yard" at Lyndonville, Vermont. 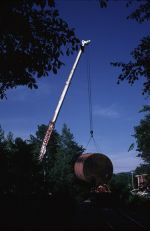 Previously, Lyndonville hosted a large yard and shop complex, but now only two of the old shop buildings, a siding, and a rapidly expanding transload business remain. Description: WACR southbound NPWJ rolls past the north end of the siding at Lyndonville, Vermont. Today's train consists of CLP GP38 204 and 10 cars of mixed freight. Description: WACR southbound NPWJ crosses the main street through the village of Passumpsic, Vermont. Today's train consists of CLP GP38-2 204 and 9 cars of mixed freight. Description: WACR southbound passenger special prepares to depart the 1883 ex-CP passenger station in St. Johnsbury, Vermont. Today's train consists of CLP GP38-2 204 and 3 ex-CNJ passenger coaches. Description: My five month old grandson watches his first ever freight train in action! A Vermont Rail System crew pulls covered hoppers across the entrance road to Lake Paran in North Bennington, VT. The covered hoppers had been stored on the easterly leg of the wye track leading out of North Bennington down into Bennington, the old Rutland Corkscrew Division. Description: WJNP crosses US 5 northbound. Description: WJNP heads north toward Lyndonville depot (beyond the bushes). Description: WJNP's power heads back to its train to continue its journey north to Newport. Description: WJNP cruises north across Coventry Station Rd. Description: WACR southbound NPWJ rolls uphill through the village of Barton, Vermont. Todays train consisted of CLP GP38-2 204, VTR GP40-2 308, and 22 cars of mixed freight. Description: WACR southbound NPWJ rolls uphill through the village of Barton, Vermont. Todays train consisted of CLP GP38-2 204, VTR GP40-2 308, and 8 cars of mixed freight. Description: The VTR Burliington Switcher (BDSW) switches Global in Burlington, Vermont. Today's train consists of CLP GP38-2 204, GMTX GP38-2 2663, and 4 tank cars.